These adorable cheesecake pops are the perfect alternative to a cake for special occasions like birthdays, wedding or baby showers...or to make any occasion special! Microwave semi-sweet morsels and shortening in dry, medium, uncovered, microwave-safe bowl on HIGH (100%) power for 1 minute; STIR. Morsels may retain some of their original shape. If necessary, microwave at additional 10- to 15-second intervals, stirring just until melted. Dip frozen cheesecake pops into melted chocolate; shaking off excess. Immediately decorate with colored sprinkles, sugars or mini morsels, if desired, before chocolate hardens. Working quickly, repeat with remaining cheesecake pops. Place on prepared baking sheet; freeze until ready to serve. Allow to soften for 5 to 10 minutes before serving. Makes 22 to 24 cake pops. 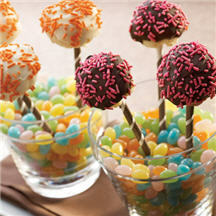 Cheesecake balls do not have to look “pretty” before they are dipped in chocolate. Crust is included in cheesecake ball. This all gets covered in a coating of chocolate. It may be a little messy, but everything works out when it is covered in chocolate! For a richer chocolate flavor, substitute three 4-ounce bars NESTLÉ® TOLL HOUSE® CHOCOLATIER 62% Cacao Bittersweet Chocolate Baking Chocolate, broken into pieces, for the semi-sweet or milk chocolate morsels.